Ram Jethmalani turned 90 years old yesterday. 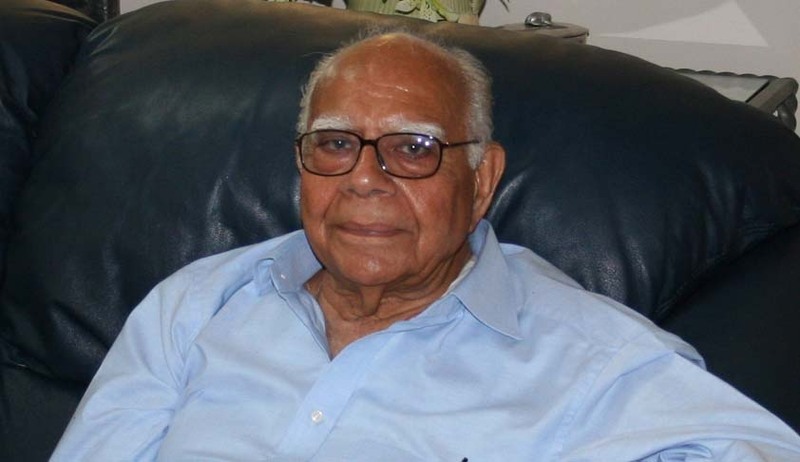 Probably the only Indian-lawyer with the most number of miles on a cruise ship, the illustrious Ram Boolchand Jethmalani, being considered a maverick and having myriad credentials to his account, recently took upon himself the tag of becoming a nonagenarian. 'I charge high fees but 90% of my practice is free’; one of many such lines that has made the legend establish a name for himself in the legal paraphernalia. As is often said, he is not the country’s highest paid lawyer for nothing. Between representing Anil Ambani in his battle with brother Mukesh Ambani, and defending Kanimozhi, Ram Jethmalani has appeared in multitude of cases, be it civil, criminal or constitutional, in almost seven decades of his practice during which he has set precedents and rewritten judicial history. Unceasingly making media headlines, he has received bouquets and brickbats in equal measure. From defending the killers of the former Prime Minister Indira Gandhi, as also the likes of Harshad Mehta and Ketan Parekh, to opposing the death sentence of Afzal Guru, he has never shied away from courting controversies. He is at ease representing DMK MP Kanimozhi and Unitech managing director Sanjay Chandra in the 2G Spectrum scam, while simultaneously fighting to bring back the black money stashed away in foreign countries. Rewinding on his calendar, his tenure has been privy to a number of crossroads, which are further an assemblage of both legal as well as bureaucratic roots. As he out-rightly claims the non-existence of conscience, Mr. Jethmalani became a member of the Rajya Sabha in 1988. Since then, he has been actively involved in the political front of the country, following which he became the Union Minister of Law, Justice and Company Affairs in 1996 in the Government of India led by Mr. Atal Bihari Vajpayee. During the second tenure of Atal Bihari Vajpayee, he was given the portfolio of Union Minister of Urban Affairs and Employment in 1998. But on 13th October 1999, he was again sworn in as the Union Minister for Law, Justice & Company Affairs. However, he was asked to resign by the Prime Minister following differences with the then Chief Justice of India, Mr. Adarsh Sein Anand and Attorney General of India, the renowned Mr. Soli Sorabjee. He was inducted into the Cabinet on the then Home Minister, Lal Krishna Advani's insistence. Mr. Jethmalani had also announced his candidature for President of India stating "I owe it to the nation to offer my services" and launched his own political fronts, the Bharat Mukti Morcha, launched as a 'mass movement' in 1987 and in 1995 he launched his own political party called ‘Pavitra Hindustan Kazhagam’, with a motto to achieve transparency in functioning of Indian Democracy. And to this legend of a man and to his immortal afflatus, from his perdurable uphill battles to his sinewy convictions about his profession, a bow of pride is what he deserves.